Is long-term declining capex the new norm? After publishing a research note about China (see March 31, 2016, Market Insight: Expect Deep Capex Cuts in China This Year), I’ve been waiting for the three Japanese carriers to release their full year financial results to look at the capex trend in Japan. With earning season in full swing, I was able to get some valuable insights from NTT DOCOMO, illustrating mastery at introducing new generations of technology that in the long run translate into less capex. As we saw in China, after a lumpy pattern created by major events like massive 3G and Long Term Evolution (LTE) rollouts in 2009 and 2014/2015, respectively, the long-term capex trend looks more reasonable and somewhat on the slow decline side. In Japan where the very first 3G wave started in 2001 when NTT DOCOMO decided to take the wideband code division multiple access (W-CDMA) plunge at a time the standard was not ready, capex also shows a lumpy pattern marked by a few bumps but a certain long-term declining trend. 3G upgrades: In 2006, 3GPP completed its W-CDMA standard and DOCOMO started to upgrade its 3G network to meet the 3GPP standard, including high-speed downlink packet access (HSDPA). This software-based upgrade was gradually rolled out from 2007 to 2010, which is clearly reflected in the chart below, indicating a consecutive four-year capex decline resulting from the lack of hardware spending. Nonetheless, DOCOMO already had HSDPA running 14Mbps downlink in major metropolitan areas by the end of 2006. LTE rollouts: In 2010, DOCOMO started to roll out its macro LTE network, which was completed nationwide in less than three years. We clearly see an increasing capex pattern from 2010 to 2012. However, at rollout peak in 2012, the chart indicates that capex stayed under the ¥800B bar compared to almost ¥1T in 2006. Fukushima disaster: The Great East Japan Earthquake of magnitude 9.0 at 2.46 pm on March 11, 2011, did considerable damage in the region, and the large tsunami it created caused very much more. However, we found that the loss of more than 6,000 3G base transceiver stations (BTSs) in the middle of a significant LTE rollout did not prompt DOCOMO to significantly hike its capex. According to DOCOMO’s report, a total of 6,720 BTSs nationwide, including 4,900 in Tohoku branch service areas, were out of service right after the disaster. The shutdown of trunk lines was the major cause of the BTS outage in the Tohoku region. As of March 28, 2011, 307 BTSs were still out of service: 224 required fixing trunk lines or transport equipment, 62 were submerged and 21 were under inspection. 68 BTSs were located in the Fukushima evacuation zone and untouched. They took three measures to restore the coverage of its service areas: (1) fixing trunk lines or using microwave or satellite temporarily, (2) repairing transport equipment and (3) let one BTS cover wider areas. All of this in record time with no significant capex hike! Advanced centralized radio access network (C-RAN) architecture upgrade: In 2013, DOCOMO announced a new architectural design that is based on a C-RAN architecture that also includes a next-generation BTS design, low power remote radio heads and LTE-Advanced (LTE-A) features such as carrier aggregation and coordinated multi-point transmission/reception (CoMP). The company asked its vendors to develop the products, and rollouts started in 2014. Since the amount of new hardware was minimal, capex continued to decline and the company plans another decline in 2016. Might SDN/NFV deployments have some impact on capex reduction? 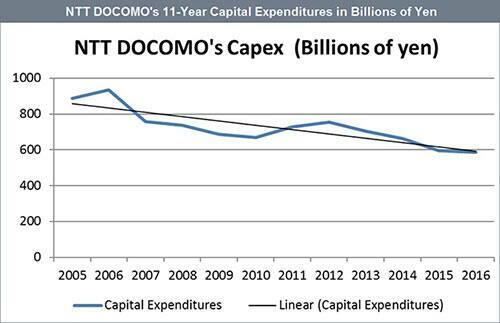 DOCOMO has been very vocal about how new technologies drive capex down — and while introducing a new generation of technology, the company did not waste time to phase out old ones like 2G. And the chart delivers a crystal clear picture: in the end, capex are going down. Although becoming more and more sophisticated and software intensive, new network gears are or will have to be less expensive and deliver more than their prior generation. What does this mean for 5G? Don’t expect any significant capex bump! When DOCOMO starts to build its 5G nationwide network in 2020, we’ll likely see a capex hike but just a few percentages above current level. Put another way, don’t expect 5G-related capex to push capex back to the 2012 level at around ¥750B. The historical pattern suggests capex are likely to rise to ¥650B at best. And finally, this trend also explains the dramatic vendor consolidation. At the beginning of 2005, Alcatel, Ericsson, Fujitsu, Hitachi, Huawei, Lucent Technologies, Marconi, Motorola, NEC, Nokia, Nortel, Panasonic Mobile Communications, Samsung and ZTE were all providing telecom gears. Where are we now?